Whether for home or commercial space, we have all the moldings you'll need to add interest and a decorative touch to your space. From window lite moldings to applied moldings, astragals, or specialty moldings, chair rails or flooring, we can help. We have standard templates or can create a custom template to meet your unique design. Quality control standards: All moldings produced by G & D Products have a ± tolerance of .005" at the time of manufacture, ensuring consistency from run to run. Hands-on Inspection Policy: All moldings are hand inspected to each customer's specific needs throughout our manufacturing process. Tooling Charges: There are no tooling charges for profiles listed on our web site. Minimum Orders: There are no minimum order quantities. Set-up fees may be added to the project cost. No set-up charges apply to our stock items. Quick Quote: Available for profiles shown, as well as your custom profiles. 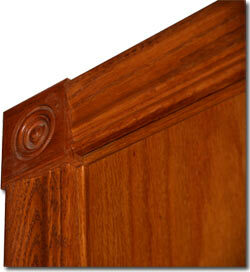 Moldings are available in 19 popular species, everything from African Mahogany to White Oak. Click here to view each species available! Click the category name to learn more about what we have to offer.